Chinese Kitchen Video Slot Guide & Review - Casino Answers! 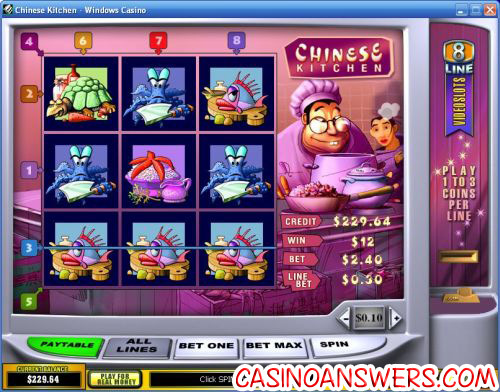 Chinese Kitchen is a 9-reel, 8-line video slot developed by Playtech. 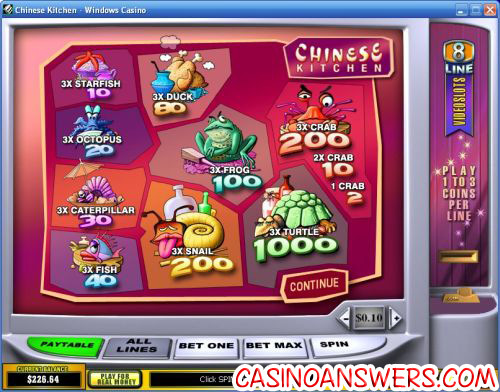 You can play Chinese Kitchen at Playtech online casinos such as Bet365 Casino and Casino Tropez. To play the Chinese Kitchen 8-line video slot, you will first want to select your coin value. Options for coin values are $0.01, $0.05, $0.10, $0.25, $0.50, $1, $2 and $5. Once your coin size value is set, you can set the amount of coins you wish to play per payline (up to 3) using the “Bet One” button. You can also hit “Bet Max” to spin the reels with the 3-coin maximum bet. Finally, you can set the number of active paylines (up to 8). You can hit the “All Lines” button to set Chinese Kitchen on all eight paylines. Once you are ready to play, hit the “Spin” button to spin the reels. The Chinese Kitchen slot machine’s top jackpot is 1000X when three Turtle symbols appear on an active payline. The second highest payout is 200X for either three Crab symbols or three Snail symbols. Click on the “Menu” button and you will be able to open Chinese Kitchen’s autoplay mode. In autoplay, you can play up to 9999 autoplay spins. Click the arrow on the left of the autoplay window to expand the autoplay window into advanced mode. In advanced mode, you can set Chinese Kitchen’s autoplay to stop when the jackpot is won, if a single win is more than (up to $99,999), when your balance gets to (up to $99,999), stop when you lose up to $99,999 and you also set the delay between autoplay spins. You can cancel the autoplay mode by hitting the “X” button. While the gameplay is a little unique, we were unimpressed by the lack of any special features on the Chinese Kitchen video slot. The Ultimate Fighters video slot is a much better version of pretty much the same game, due to actually having some special features. Still, you can try Chinese Kitchen and see with yourself with a 100% up to $200 signup bonus at Bet365 Casino. Are US players able to play the Chinese Kitchen video slot? US players are not accepted at Playtech online casinos at this time. For a great selection of video slots that are unique in their own way called iSlots and a $2400 signup bonus, please visit the US-friendly This is Vegas Casino. What casinos have the food-based Chinese Kitchen casino game?